On a mission to try most things. Within reason. I found myself marooned in stormy weather in Islington today and took refuge in the Duke of Cambridge organic pub in Islington, London. I was introduced to this pub some years ago by my brother who seems to have an internal map for every truly special or boutique London pub in just about any area you can think of. This was not the best meal I have had at the DoC. However this is only because it was late lunchtime, and I chose a simple and warming leek and potato soup (with parmesan) thanks to the sub arctic weather. I have had more glam pub meals there previously. The soup did rank up amongst the best-in-class leek and potato soups I have ever had. Or made. I accompanied it with a hearty glass of organic Argentinian malbec which went down very well given the weather. 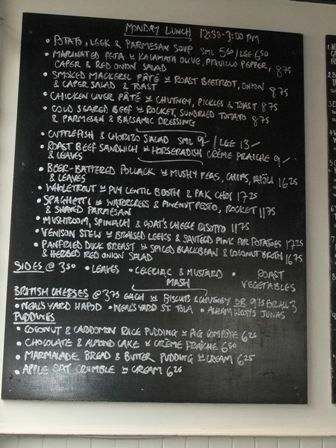 Blackboard menu based on what’s fresh, that changes every day. And changes during the day as things run out. Really good and interesting hearty pub food. Locally sourced organic ingredients, in season, from sustainable sources. Organic beer and cider – on tap. Organic everything else you can think of including tampons from the dispenser in the ladies. I strongly recommend this place and would go so far as to say it is worth a trip for Sunday lunch. I confess to being 100% daunted by hospital food. Want email updates on newly undaunted stuff?